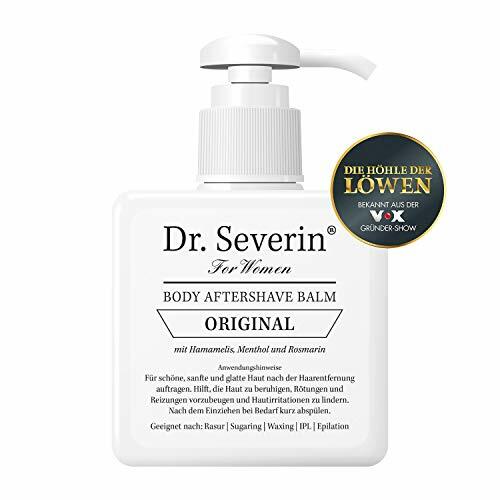 The Dr. Severin Women Original Body Aftershave Balm helps effectively against inflammations, shaving spots and skin irritations on armpits, legs and in the genital area. It's particularly designed to be applied after shaving, epilation, waxing or sugaring, but it can also be used for general skin care. The Dr. Severin Women Original Body Aftershave Balm has a soothing and antibacterial effect on the skin. In sensitive shaving areas like the genital area or the armpits, the skin needs a proper treatment after epilating. The Dr. Severin Women Original Body Aftershave Balm effectively prevents shaving spots, is absorbed quickly and soothes the skin. Active ingredients: Hamamelis Virginiana and provitamin B5. Free of parabens and aluminum. The product is vegan and was developed without alcohol.